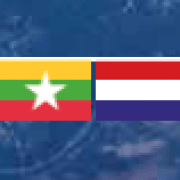 Mr. Johan Heymans has recently been appointed as the Delegated Representative of the Netherlands for Water Cooperation in Myanmar. Mr Heymans has experience as a specialist, trainer, lecturer, project manager and project director in water resources development, in the Netherlands as well as abroad. Starting this month he will work from the Embassy of the Kingdom of the Netherlands. Myanmar, a beautiful country with many challenges!" "My name is Johan Heymans, I will start in January as Delegated Representative of the Netherlands for Water Cooperation in Yangon. After graduating in Land and Water Management at the Agricultural University in Wageningen I have worked over 30 years in integrated water resources management worldwide. I started as associate expert for the Dutch Ministry of Foreign Affairs (DGIS) in Zambia, Indonesia and Bangladesh. Thereafter I joined DHV and continued to work in international projects in Pakistan, Sri Lanka, China, Trinidad &Tobago and Mauritius, mainly on irrigation development and river basin planning. Within DHV I switched in 2002 to the Dutch water sector and started working on climate change adaption, the Water Framework Directive and the Delta Programme. In the past 5 years I combined working as a freelance consultant in the Netherlands, China and Kyrgyzstan with lecturing Water Management at the University of Applied Sciences in Rotterdam. And now Myanmar, a beautiful country with many challenges!"